We hope you will join our family of happy and satisfied customers! (Please see our listing on Yelp.) and Google Business. 2/17/19 Was looking a hitch for my 2003 Jeep looked all over and decided to go with Eyers because of the remarks on Yelp. After some logistical issues with their carrier the hitch finally got to Eyers,I was in the area. I got a call around 4:30 and was there in minutes. The crew got on it right away after a few installation fitments issues, being a custom fit that was expected the crew got it done in no time. Everyone was professional and made sure the job was done right even though they had the stay over their closing time. I would definitely and highly recommend Eyers for all your trailer needs. 10/25/18 I give this company 5 stars. Last april 2017 they put a new trailer hitch with 2 inch receiver on my Highlander. And it has been great with no problems. On 10/24/2018 I had Eyers put on round nerf steps on my highlander. They also did a great job. And their prices are very reasonable also. I recommend them highly. But do your home work before you get any work done to your car are truck so you will be happy also. 8/23/18 If you need a Trailer Hitch, Eyers is the place. I made an appointment to have a hitch installed on my Honda Odyssey for the next day. They ordered the Hitch and had it ready. I was a little early, but they took me right away. I was in and out in half an hour. Highly recommended. November 2018 Great place to address your trailer pulling system's maintenance needs. Pulling your trailer into the place can be a little tight. An important trick is to pull all the way through and down into the cul-de-sac behind the complex if there's no place to park your rig. November 2018 Family-run company for 50+ years! Honest and fair people to work with. Installed a class 1 hitch on my car, price was cheaper than Rack n Road. I brought my own hitch but they give you a discount on hitch install if you buy a hitch through them. Also check out their website on lots of good info on hitches and towing. August 2018 Stopped in to quickly change out the hitch on my truck before work. They helped me quickly and I was on my way in 10 minutes! August 2018 Needed a new hitch installed on my truck. They didn't have it but order, had it next day and installed in 1 hr. Dec 2, 2017 Excellent work. Fair prices. Oct 9, 2017 High quality work, knowledgeable folks. Oct 6, 2017 I have had these guys install tow bars on three different vehicles over the last 12 years. they always have done a good job. Aug 10, 2017 Cecil has been there for 50 years! It is a historical experience to notice how the biz is run by little notes, dog on the background and the all team came to help with the hitch design and installation. Jul 7, 2017 I wanted a hitch for my SUV, so I went in and ordered the hitch, it came in two days later. It was installed in less than 30 minutes. Now we are ready to haul our small trailer. Oct 12, 2016 Beyond helpful staff. They gave us 4 options to solve our problem...ranging from very expensive to not a dollar. We went with a very inexpensive option. Such a help, thanks guys!!! Aug 18, 2016 Very good, fast service and reasonable price! Aug 16, 2016 Quality service. Sep 26, 2015 After a bad experience with uhaul, we went here, and they did a great job. It was also cheaper. Sep 22, 2015 Great group of guys fairly price always take care of me on the spot! Jun 26, 2015 Cecil and Eric were terrific - great customer service and trouble-shooting skills. They fit us in for a short notice appointment and installed a (trailer) brake controller on our vehicle. When it wasn't working properly the next day, they squeezed us into their schedule same day and determined that the trailer wiring had previous problems that weren't fixed properly, causing a short. They promptly fixed the issues and sent us safely on our way. Sep 13, 2012 Came in with an intermittent fault in my car's left rear lights, sent by Fierro's Repair on Main Street. Eyers agreed it was likely the wiring, but quickly found the real problem was a partially broken tail light with poor contacts. Labor $20, parts $4, repaired and on my way in less than 30 minutes. Great find. Quality people, thanks! Got in, it was fast and before I knew it the work was done. I didn't even have time to relax. Wish they had a couch to sit on while I was waiting but they had a few chairs. I will be back with my next truck when I need another hitch put on. I have been going here for 6 years. They installed tow brackets on two Hondas that I pull behind my RV. Quality work, fair price. Done exactly when they said it would be, everything worked just as it should. Great to find a place that could completely set up my van for towing a trailer - both the transmission cooling and all of the wiring as a one stop shop. Owner seemed nice enough, prices were reasonable, happy to support a local family business, and yes, there's a dog on site but he's a friendly and nice lab. Also, they have a great website with a ton of general info for folks just learning about towing trailers. Highly recommended. I had Eyers install a trailer brake module on my 2015 Landrover and they did it in less than 1 hour with a pre-booked appointment. Very professional service and fair price! This shop is excellent! I live in San Francisco and the drive here was so worth it. I called them to get a quote on a hitch installation on my CX-5 and the price was reasonable compared to the ones I got here in San Francisco and they were even able to accommodate me the same day (I'm talking about 30 mins right after I called). I highly recommend this place. This is now my go to place for all my cargo & trailer needs. I have used them on multiple trucks for multiple trailers. They are experts about hitches, towing and setup. Highly recommend for 5th wheel or bumper tow weight distribution. Service is awesome. After my experience at Eyers Hitch Center, I would never even consider having a hitch installed anywhere else. I called around a few places and Eyers gave me the lowest quote by quite a bit, bit knowing what I know now I would go to Eyers even if it did cost more. Cecil and Eric were knowledgable, friendly and efficient. They even no charge taped up some loose wires from a less than perfect previous retrofit of my tail lights while installing the cable for the lights for towed trailers. And hey, who doesn't love a great old fashioned 'mom n' pop' shop (actually father and son team) that beats the big guys. Also, I bought a super cool made-in-Sunnyvale bike rack called Truckee by Hitch Rider from Eyers. Well designed product by someone that likely designed it for himself first. Lots of other cool hitch related gadgets in the waiting room as well. Cody, you were awesome (you know who you are). These guys are great! They put on the hitch and electrical on my Hummer. I have a custom exhaust system but they made it work without issue and finished much sooner than I had anticipated. When I got back to pick my vehicle up it was even like $100 less than my original quote. I wanted to put a trailer hitch onto my Toyota Yaris Sedan for putting on a bike rack. I called them, and they needed to order the hitch as special order. It only took two days, and shortly after I had an appointment to install the hitch. I could not even finish my coffee at the nearby Starbucks and they were already done. Price was reasonable for installing the hitch ($45 for the labor + price for the hitch, in my case $210). Excellent work and very quick! Thanks! My friend referred me to Eyers Hitch for my bike rack. I called Cecil and he asked for my car Make and Model. The quotation was done over the phone and he went ahead and ordered the hitch on the same day. He then called me a day later telling me the hitch has arrived. The installation appointment was easy to make and although Cecil quoted 45 minutes for the installation, he got it done in 15 minutes ! The experience was wonderful! I would definitely recommend my friend to Eyers! I called up Cecil weeks ago to order a hitch. He ordered it with a CC to be charged, only if I didn't pick it up for a re-stocking fee. Then I had car issues where I could not bring the car in for 3 weeks. He just held the hitch for me and told me to call for an appointment when the car was back and I was free. I got the car back and scheduled a lunch appointment. He had the hitch in and wired in 1.5 hours. Great service and work. …(The job) reflected a high degree of professionalism with regard to both quality and safety. Thank you for the excellent workmanship and service. Thanks for good work, honestly priced and promptly done! I’ll recommend you highly – over the Internet too! Thank you…for the reliable, quality craftsmanship you have been providing for me for about 30 years! Keep up the good work! I would highly recommend Eyers Hitch Center to anyone who would need the type of service you offer. Went in with my 2005 Yukon after being quoted $2000 from Toscano RV in Los Banos spoke with Cecil several times and set up a time for dropping my vehicle. He quoted $580 which was great until the RV place said I needed an additional item which would have totally throw out my finances. Cecil worked with me to find used part to complete my install costing me $726 including taxes. My vehicle came with absolutely no towing package. He was professional, knowledgeable and friendly. I'd recommend him to anyone looking for a honest local business man. I'll sure be back when Im ready to install my bike rack. Great place to get your hitch and wiring done! Easy appointment, in and out in a jiff, and I totally trust the work done! No brainer here, need a hitch, stay away from other places and get it done right! Stopped by Thursday to check on an upgraded shock setup for my 78 El Camino. They were able to get the parts same day and $400 later I have air adjust rear shocks and new front racing shocks. The old ones were shot. They were fast and reasonably priced. Found Eyers via a friend's recommendation and now I would also recommend them. I needed a hitch mount for my 2011 Ford Explorer and was on a tight schedule. I called Eyers...they told me they could get the part overnight and install it right away. I showed up for my appointment, they installed it quickly and the price was reasonable (I could have purchased on-line for less and wasted a 1/2 day of my time, but I decided it wasn't worth the effort.) Good experience, would recommend. I was referred here by the good reviews on yelp and nobody lied. I dealt with Cecil the owner on the phone and we got my hitch ordered so it came the next day around 10:00. I came in at 10:30 and got my hitch, harnessing, wiring, and hitch ball installed in under an hour. Cecil was very friendly and the hitch and wiring under closer inspection look great. The wiring harness is conveniently in the trunk of my car and the hitch looks great. I would recommend to anyone looking to get a truck hitch on a car, truck, SUV, or whatever. I called this location yesterday to schedule a hitch installed on my Mitsubishi Outlander. I stopped by today (2/17) at 8:30am. I had the hitch in my trunk. The installation took 20mns. Very professional and effective place, they know their job. Extremely professional, knowledgeable, and friendly. I highly recommend Eyers Hitch Center. I purchased a hitch and an electric brake controller elsewhere thinking I would install it myself. I completed the hitch but the electric brake control was more than I was willing to take on. I called Eyers Hitch. In less then 5 minutes I had a quote and an appointment. Showed up for the appointment, the owner (the son) inspected the parts I had added a bracket that I did not have and began installation. The wires are neatly run in existing looms, where possible hardware is mounted using existing screws and bolts so that no new holes are drilled. Where new holes are required they are clean, neat and square. Great place. Highly recommended. I would like to recommend Eyers Hitch Center to anyone needing trailer hitches, trailer repairs, bicycle racks or towing accessories. Back in the 1970's, my dad took our family car to Eyers to get a hitch installed so he could pull a travel trailer. Imagine my surprise when, as an adult and needing a hitch, I learned they were still in business! 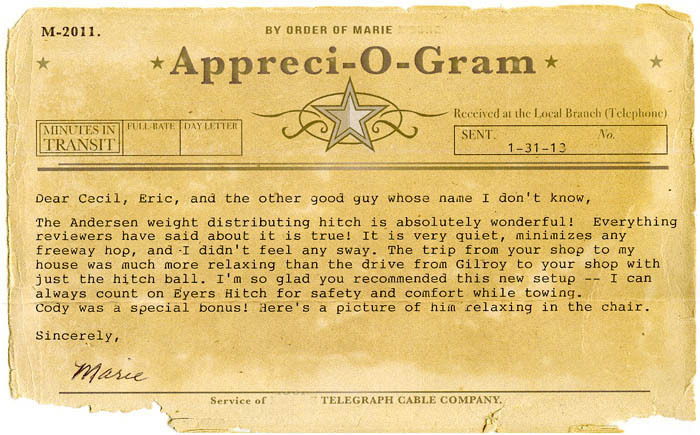 The same great service my dad received back then was still in full force. Cecil, Eric and the crew are experts in their field and bend over backwards to satisfy their customers. I still utilize their services today. In the past few years, they have custom-built an extended hitch for our camper and, most recently, installed a Warn bumper/winch and Brake Buddy on our new Jeep and customized a new hitch for our Winnebago motorhome. We are 110% satisfied with their work and would encourage anyone needing a trailer hitch, etc., to stop by Eyers Hitch Center in Santa Clara! I went to Eyers today to have wiring installed for my trailer hitch on a Lexus RX 330. Eyers did a nice clean job of cabling with good ties. I will definitely recommend them for others for trailer hitch needs. Needed a hitch put on my TSX, and my dealership recommended Eyers. I called them and they ordered the hitch for me, which came in the following day. A few days later I went in and they did a quick & professional installation in around 30 minutes. Professional, fast, very inexpensive--highly recommended! Called for an appointment and got one the next day. Asked them to install trailer brakes and then try to figure out some 'creative' wiring the previous owner had done. Basically, there was a switch for a wireless camera and rear lights for ease of hitching up and I couldn't get them to work. 2.5 hours after I dropped it off, I got a phone call that the truck was ready and everything worked! These are real professionals. No guff, no fooling around, full explanation of what they will be / are doing. Ordered the hitch, made an instalation appointment, arrived a little early and the work started on time and was completed within the stated finish time. They mean what they say. Well worth the 32 mile drive for a job well done. Thanks. The only place to go for a hitch, or hitching issues. Had them install a hitch on our 1990 Volvo station wagon. Very reasonable on price and the work performed was first rate. Don't go anywhere except Eyers. I remember asking my dad where to get a hitch installed at and he told me Here. Excellent service friendly people and installed while you wait in a timely manner. Ever need a hitch give them a call. Price was very reasonable.